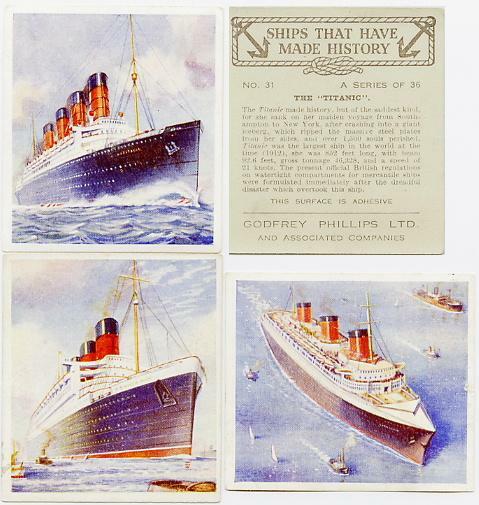 These are part of a 1938 cigarette card set of 36 entitled "Ships That Have Made History" by Godfrey Phillips LTD. At top is the Titanic, both front and back. Bottom left is a very early card of the Queen Mary and next is the Normandie. 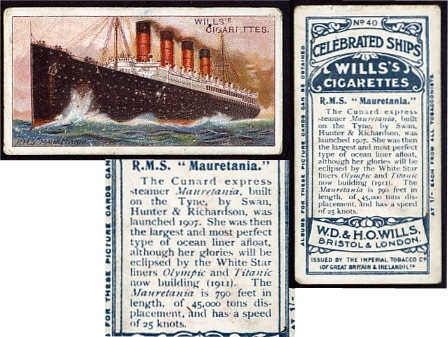 Not exactly a Titanic card but this 1911 Will's Cigarettes Celebrated Ships RMS Mauretania card mentions both the Titanic and Olympic on the reverse. "launched in 1907 she was then the largest and most perfect ocean liner afloat, although her glory days will be eclipsed by the White Star Line Olympic and Titanic now building (1911). Circa 1951 Australian trade card "The Wreck of the Titanic" from the "Wonder Book of General Knowledge" series by the Sanitarium Health Food Co.